Fight for Democracy India that's your country go. Millions of people have poured into the streets in recent days to join courageous protests challenging the far-right government of Prime Minister Narendra Modi in India. Modi has failed to accomplish his major campaign promise of economic development. Instead his government has given India four years of anti-worker, anti-farmer, ethnic and religious chauvinist, and anti-women policies. Modi’s far-right BJP party is deeply concerned about its prospects in upcoming national elections later this year. 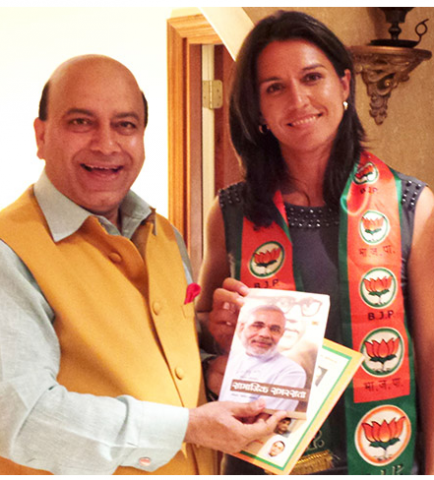 In case you can't make that out, this is Tulsi Gabbard wearing a BJP sash, standing with U.S. BJP supporter Vijay Jolly. Holding a picture of Nahendra Modi. I remembered having seen Jolly's name, googled him and I saw his Wikipedia page, it does say he belongs to BJP, but what about RSS??? Search didn't bring up the kind of stuff I was looking for, RSS stuff. I added RSS to the search string and found what I was looking for, he does also belong to RSS. "Jolly also joined the RSS — Rashtriya Swayamsevak Sangh — the right-wing paramilitary limb of the party, known for objections to India’s religious pluralism and its belief in Hindu nationalism. He’s still a “proud member,” he says." "Herein lies the controversy. The RSS has been vocally anti-Muslim at best and violent at worst. With me, Jolly is vehement about his “tolerant values,” never once calls his party Hindu nationalist and cites more than once his belief in pluralism. When I ask about Muslims’ place in India, he doesn’t skip a beat: “Our enemies have always portrayed us as anti-Muslim, anti-Christian, anti-minority. We are tolerant. We will never say, ‘We are better than you.’” Plus, he argues, India never would have elected Modi last year had the party been a solely Hindu party. (That argument doesn’t quite stack up; Hindus make up about 80 percent of India, while Muslims are only 15 percent.)" "Before we hang up, Jolly asks for my two-minute bio. I tell him: American-born, first-generation parents; Chicago, Atlanta, San Francisco. He “hmm”s with familiarity. “Send me some photos of yourself after this call, please,” he requests, as though that will bridge the oceans and continents sitting between us." It would seem something bridged the oceans and continents sitting between Jolly and Gabbard, her wearing his sash.